Stephen has been painting at the Penninis end of Porthcressa Beach over the last couple of days. It’s an early morning painting so I’ve been getting a mug of tea at 7am just before he heads out with his huge rucksack. He always takes a 1 litre stainless steel flask of hot weak black tea and a sandwich with him for breakfast. Apparently he had a discussion with someone this morning about his chosen filling – Marmite/Peanut Butter/ Orange Marmalade ….. He’s out painting until just before midday (when he probably gets hungry and starts thinking about lunch) so he heads back to Glandore Gallery. The following images were taken on the second day of painting so probaby after seven or eight hours work. This is a vertical ‘portrait’ format painting which is probably his favourite because he can get good detail in the foreground but also a real sense of depth in the middle and far distance. The second image is a detail of the work already done, showing the intricate shadows and shapes in the granite rock as well as the profusion of flowers and details of the foreground petals. The weather forecast looks good for the next couple of days at least so hopefully this painting will be finished soon! 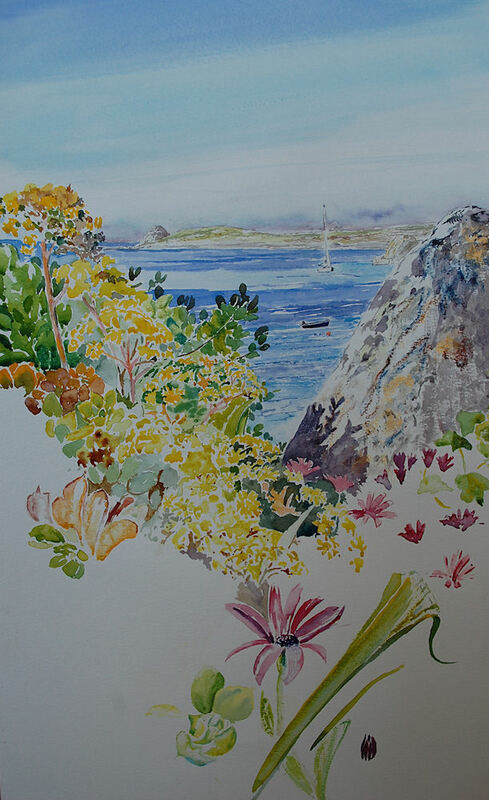 Here are some other paintings that he has completed this spring – the first one was painted near Cromwell’s Castle on Tresco and the other two were painted at Porthmellon – one a landscape format beach painting and one a portrait format flora and beach painting. None of the paintings have proper titles yet, the ones given are only ‘working’ titles. Sometimes, if a painting is untitled when sold, Stephen likes to give the purchaser the option to give it a title themselves. 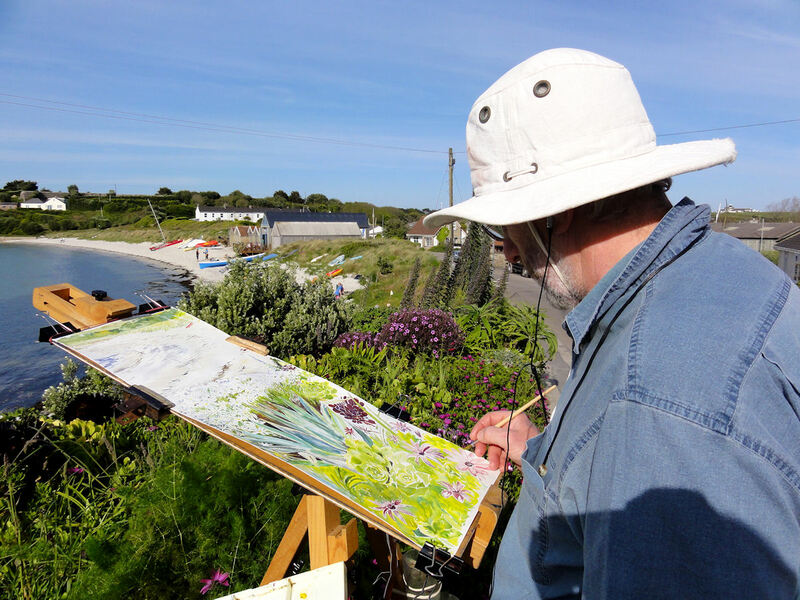 And finally, Stephen working on the last painting, on Porthmellon, May 25th 2013.